Palm trees, tick. Tropical ocean, tick. Dolphins,tick. Sun loungers, tick. A blissful week of proper paradise. Pricey, and a long way to go for a week, but such a treat, and well worth it for us this time. We loved: The sunshine, the whole paradise vibe, the mix of Indian, Creole, French and Chinese food, swimming with dolphins and snorkelling. Hints: We went to stunningly beautiful Southern Mauritius which is apparently less developed than the North / West. Take proper Factor 50! Don’t try to wing it with last year’s half empty bottle of Factor 20 like we did. When we asked the kids what they wanted for their next holiday they immediately and unanimously declared a pressing need for a ‘proper beach holiday’ with palm trees, tropical seas and sunshine. I can’t really blame them: we’ve taken lots and lots of family holidays over the years, hardly any of which would qualify as a ‘proper beach holiday’. We love camping, cycling, canoeing, pootling about in the van, they said, but this time could we PLEASE lie on a lounger sipping cold drinks, not wear shoes for a week (or maybe just flip-flops) with the occasional dip in the sea or pool to cool off? OK, we said (feigning reluctance but secretly quite delighted at the prospect of all those palm trees etc etc) — and promptly set about attempting to book ourselves a nice bit of winter sun. We started looking for the Christmas hols — and very nearly booked a Florida trip — but came to the conclusion that this was possibly a compromise in terms of people-to-palm-tree-ratios. Everything is SO expensive at Christmas anyway, so shifting five human beings into another hemisphere and holiday season at that time of year was just too costly to consider anywhere further. Waiting till February half term immediately saw a huge drop in the price which opened up other options. No brainer. We could wait another 6 weeks for lapping water and coconuts if it meant saving ££. And again, the girls this time. Guess which one of these four lasted less than a minute in the doughnut? This holiday saw a series of firsts for this family of holidaymakers. First, we booked it well early (as soon as we’d made the decision to postpone, in fact). Secondly, we booked with a Tour Operator (Thomas Cook Signature, whatever that means). Thirdly, we flew from London overnight — our first long-haul flight, and our first overnighter (mixed reviews depending on size of the reviewer and therefore comfort). Highlights of the week? Definitely swimming with wild spinner dolphins out of Tamarin bay – an unforgettable and probably unrepeatable experience. Despite some trepidation before setting out (after a hair raising boat ride in Croatia Garry and I were determined to be Mr and Mrs Health and Safety) the trip exceeded our expectations — we found 2 pods, the second much more amenable to humans swimming near to them, and there were no other boats, so less angst about bodies and boats in the water at the same time. The kids all swam with around 30-40 wild dolphins, including, to much delight, a mother and baby. We also loved our (eye-wateringly expensive) crab shack dinner on the beach. Because all the other diners were couples somebody had very wisely made the decision to put our table as far away as possible from everyone else — good for them, and wonderful for us, as we were literally eating on the beach. This morning we arrived on the beach to find the gardening team had shaved all the coconuts from the trees — in case they fall and injure someone? On the downside, it was HOT, so it was also the first time some of us burned (ever so slightly and we were not alone by any means — you could have lit the dining room entirely from the glow of rosy-skinned Europeans every night), we had to plaster ourselves in factor 50 before leaving the room and stay in the shade much of the day. Other downsides? Despite being reminded every 3.4 minutes how lucky they were, I’m not sure the kids properly appreciated the luxury of the holiday, or made the most of the destination. Example? They preferred playing games in the pool (Marco Polo, 40-40 in and the Silent Game current favourites — or stalking a sibling slightly grumpily) to snorkelling in the ocean a few steps away which felt like a bit of a wasted opportunity. 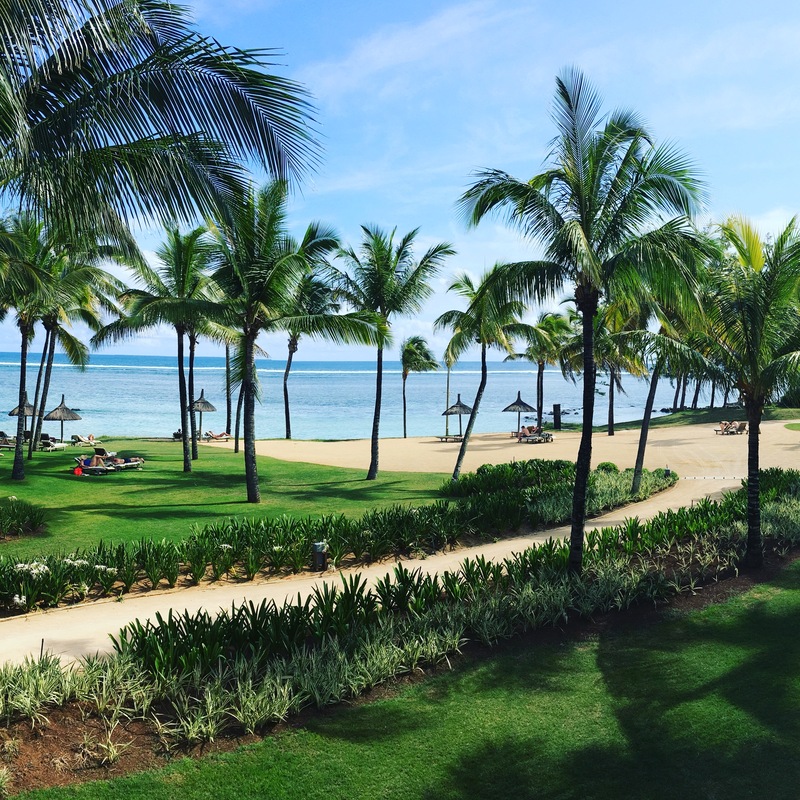 We did also feel a bit odd about being confined to our resort — although we agreed the week was all about decadent laziness in a beautiful setting, we’re just not used to being so static, so there was a sense of guilt about the wonders of Mauritius being ignored. I took a few photos on the way to and back from the dolphin boat trip (see above) and got the impression of a vibrant, diverse, beautiful country — it would definitely be worth coming when it’s cooler, for longer, to properly explore the whole island. What we got was just a tiny snapshot of what Mauritius has to offer. If you’re after winter sun and proper paradise Mauritius must be hard to beat. It’s a long flight, but overnight, and the time difference is only 4 hours so there’s no jet lag to contend with.